On 29th January 2017, over 130 people visited Jealotts Hill Community Landshare (JHCL) to enjoy a traditional Wassail celebration despite the drizzling rain. 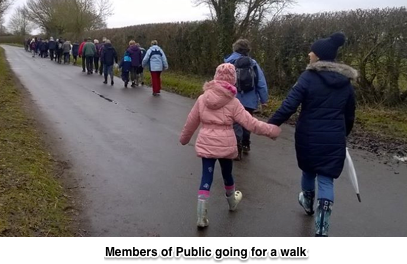 Approximately 90 members of the public first enjoyed a guided walk, led by local historian Hugh Fitzwilliams, and toured the local Warfield countryside to the JHCL site. 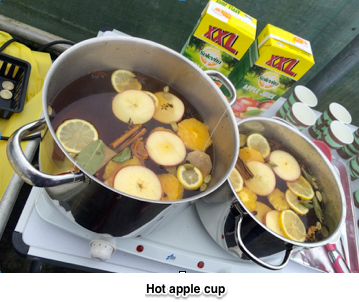 The group then returned to JHCL to be greeted by a bonfire, hot drinks including a spiced apple cup, cakes and stalls, to warm up and socialise. 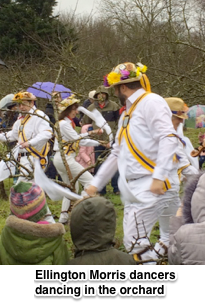 Ellington Morris Dancers led the traditional Wassail celebrations in the orchard which included dancing, pouring apple juice on the tree roots and singing. Wassailing was first practiced in the cider orchards of southern England dating back to 1585 to improve the harvest. The annual Walk ‘n’ Wassail at JHCL will be held again in January 2018.